Most mission studies have focused on the work of Western missionaries going to Majority World countries, with few examining indigenous churches and their relationship with Western mission agencies in practicing mission. This book is a historical study of the relationship between the Evangelical Church in Egypt and the American Presbyterian Mission. Wahba covers from when the missionary work began in 1854 until after the departure of the Mission from Egypt in 1967, and the transfer of all the work to the Egyptian Evangelical Church. Tracing the mission work of Egyptians within Egypt and neighbouring Sudan, Wahba analyses the impact that the relationship with the American Mission had and how it determined the indigenous Church's practice and perspective of mission. 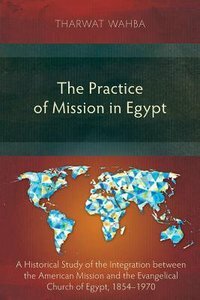 About "The Practice of Mission in Egypt: A Historical Study of the Integration Between the American Mission and the Evangelical Church of Egypt, 1854-1970"